This has it all. Great sky, beautiful composition, the colors of fall and I really like the building to help ground the shot. Very nice. 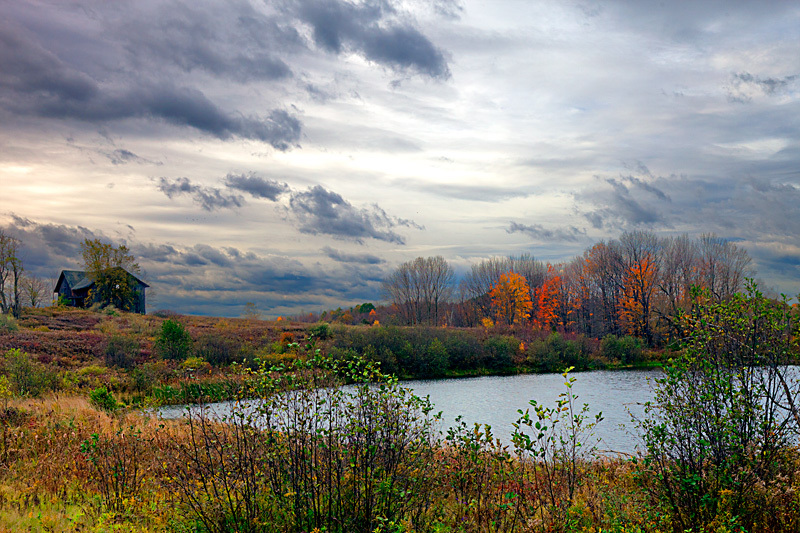 Terrific sky and autumn colors. For me the green shrubs up front are too tall and take away impact from the far shore. I like it but then again I wish I would have seen more water. To me the water isn't a major subject in this. I wish you were closer to the water or would have shown more of it. The colors are great and you picked a good day with a dramatic sky. Well done. the whole dead tree, colorful tree - treeline on the other side of the pond is nice. there is a great feeling of mid-to-late fall in this shot- and the coming of winter. Proudly hosted by Sargasso Networks. Current Server Time: 04/20/2019 01:06:09 AM EDT.